There are optional add-on packages you can purchases separately from the main game. The packages add bonus content and characters to the game. You do not have to buy the add-ons. The add-ons cost 400 wii points each, and the content is added automatically to any game of My Little Shop you are playing. Juice Bar Set - 400 points - This add-on unlocks Popuri from Harvest Moon 64 as a customer, and adds the Juice Storefront, Juice Awning, Juice Roof, and Jack-O'-Lantern decoration. 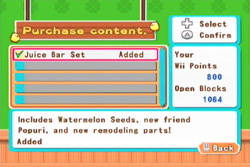 Watermelon seeds are added to the Seed Shop, which triggers an (up to) 800 point bonus when playing the Juice Shop game. Egg Stand Set - 400 points - Adds Skye from Harvest Moon DS Cute as a customer, a Turkey as a poultry animal, the Egg Storefront, Egg Awning, Egg Roof, and Egg Nest decoration. Ice Cream Set - 400 points - Unlocks Ann from Harvest Moon 64 as a customer, and adds a Strawberry Cow, Ice Cream Storefront, Ice Cream Awning, Ice Cream Roof, and Cow decoration. New Friends Set - 400 points - Five new customers; Cliff from Harvest Moon 64, Sara from Harvest Moon GBC 3, Leia from Harvest Moon DS, and Amanda and Adam from Magical Melody (known as Tina and Tito in the Japanese version).